All steel, fully adjustable for windage and elevation, V-rear blade gives fast sight alignment. Use with a tritium or white Big Dot front sight for a bar-dot setup. SPECS: Steel, black, matte finish. 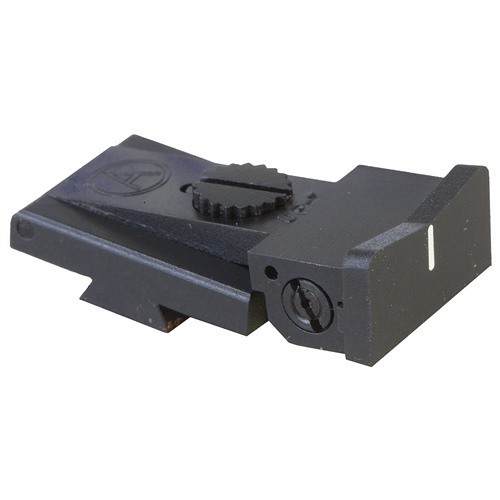 Rear Sight: Blade - .760" (19.3mm) wide, .385" (9.8mm) high. Body - 1.5" (3.7mm) long, .72" (17.5mm) wide. Fits BM-1 sight cut. Use with .180" high front sight. Alle stål, fullt justerbar for windage og høyde, V-bak bladet gir rask syn justering. Bruk med en tritium eller hvit store Dot fremsikte for en bar-dot-oppsett. Spesifikasjoner: stål, sort, matt finish. REAR Sight: Blade -. 760"(19,3 mm) bred. 385" (15.7 mm) høye. Body - 1,5"(3.7 mm) lang,. 72" (17,5 mm) bred. Passer BM-1 syn kutt. Bruke med. 180" høye fremsikte. I recommend this sight for anyone who wants a quick acquisition sight. I put this on my Para Ordnance P-14 pistol. It has made a great self defense pistol and hunting pistol. If your eyes are not what they used to be this in conjunction with a big XS Dot Front Sight are what you need. I had a Bomar rear sight and a staked post front sight I had used for years on my SA 1911 .45 ACP. My eyes would not let me focus on the sights. I had to get a Gunsmith to mill my slide for the Big Dot Front. But th Bomar cut rear sight fit like a glove. It was dead on. The sight alignment with this is almost natural. Center Mass was not a problem at 5-10-15-20 or 25 yards. I plan on witching out the sights on my Glock 26 to these and also on my SA XDM .45. I currently have the fixed version of the same XS Sight. I highly recommend either for the beginner, or experienced. I shoot various steel, and USPSA events. This system helped me jump up the line, because of its quick acquisition of the sight picture down range. It's great for home defense, as it glows in the tritium version, and all you do is focus on the front sight, plant it where you want the round, and bam! It's there. I chose the adjustable version this time, as I didn't see it available on my original purchase. Produsentnr. : 202145A3301 647533006248 Alle stål, fullt justerbar for windage og høyde, V-bak bladet gir rask syn justering. Bruk med en tritium eller hvit store Dot fremsikte for en bar-dot-oppsett.